Type Specimen The type specimen of the European Atlantic sturgeon Acipenser sturio was identified by Swedish botanist Carl Linnaeus, father of binomial nomenclature. The specimen is housed in the Natural History Museum, London. Note that Linnaeus, as a botanist by training, had his collectors press fish specimens on herbarium sheets! Photo by Dr. Eric Hilton. Cleared & Stained Specimen A ventral view of a small juvenile lake sturgeon (Acipenser fulvescens), an entirely freshwater species from much of the Mississippi basin of North America. 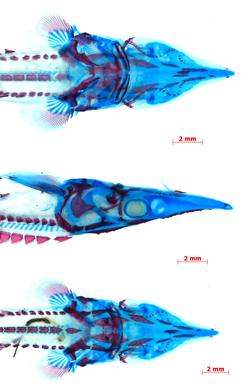 This specimen has been cleared and stained (bone stained red and cartilage stained blue) for study of the early development of the skeleton. Scale bar is 2 mm. Photo by Casey Dillman. Beluga Sturgeon The Beluga sturgeon is one of the world’s largest fishes, historically having reached 5 meters (16.4 feet) or more in length. This photo was taken of a live specimen in the collection of the Tennessee Aquarium. Photo by Dr. Eric Hilton. Digital Reconstruction A digital reconstruction of the skull of the Great Amu Darya sturgeon, Pseudoscaphirhynchus kaufmanni. This specimen, from the collection of the University of Alabama (UAIC 13265.01) was collected in Turkmenistan in 1999. Image courtesy of Dr. Eric Hilton. Like Indiana Jones, professor Eric Hilton of the Virginia Institute of Marine Science is scouring museum shelves around the world in search of hidden treasures. But instead of crystal skulls or the Ark of the Covenant, Hilton’s holy grail is to correctly identify new and preserved sturgeon specimens in order to resolve the tangled classification of one of the world’s most ancient and threatened group of fishes. Of the 25 currently recognized species of sturgeon worldwide, every one is endangered, threatened, or otherwise afforded some type of legal protection. They suffer from overfishing (mostly for caviar), habitat loss, dam building, and boat strikes, among other threats. NOAA’s National Marine Fisheries Service has proposed that the Atlantic sturgeon, native to Chesapeake Bay and its tributaries, be listed as an endangered species. Hilton’s work—funded by a 3-year grant from the National Science Foundation—will likely include future trips to the Linnaeus Collection in Uppsala, Sweden; the Sturgeon Research Center in Krasnodar, Russia (near the Black Sea); the East China Sea Research Institute in Shanghai, China; and—closer to home—the Field Museum in Chicago, the Illinois Natural History Survey Collection, and the University of Alabama. He has already visited one collection at the Institute of Hydrobiology in Wuhan, China. Hilton’s study will be the first modern attempt to sort the taxonomy of all sturgeons at all levels—from family to genus to species. Although researchers have recently made strides toward cleaning up sturgeon classification, problems persist. During the last century, scientists have used more than 20 different names to describe the 4 currently recognized sturgeon genera. Hilton says the species-level taxonomy of sturgeons is even more confused, with hundreds of names for the 25 currently recognized species. The researchers will focus their attention on the “type specimen” of different sturgeon species around the world. Like the official platinum-iridium cylinder that defines the mass of a kilogram and pound, a type specimen is the single preserved organism that scientists use to define exactly what is and is not included in a particular species. Unfortunately, says Hilton, “Ten of the sturgeon species that are currently considered valid have no known type materials, and the type specimens of an additional four species are considered lost.” Hilton and his collaborators will assign new type specimens to these species in order to stabilize the current use of species names. 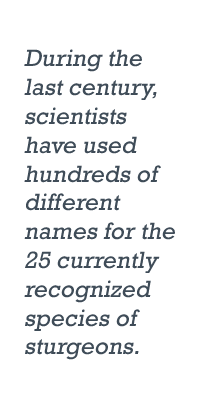 They’ll conduct all their work in accordance with the International Code for Zoological Nomenclature, the globally accepted set of rules for naming organisms. Hilton and his collaborators will combine traditional and newer techniques to help clear up the taxonomic confusion. Hilton is an internationally recognized expert in sturgeon anatomy and classification, using dissection and detailed studies of a sturgeon’s skeleton, muscles, and morphology to place a specimen in the correct species. Dillman and graduate student Katie May Laumann bring expertise in studying the genetic material within the nucleus and mitochondria of sturgeon cells. The VIMS team will collect tissue from each new specimen studied, returning the samples to the Fish Collection at VIMS for archiving, genetic analysis, and sharing with other labs. Archiving and sharing their data is in fact a key part of the project, says Hilton. 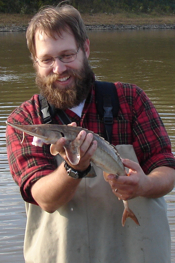 “For each sturgeon group,” he says, “we’ll publish detailed taxonomic accounts in the scientific literature, including illustrations and high-resolution photographs of type materials and new specimens.” The team will also use the VIMS website to present a detailed taxonomic account for each species.